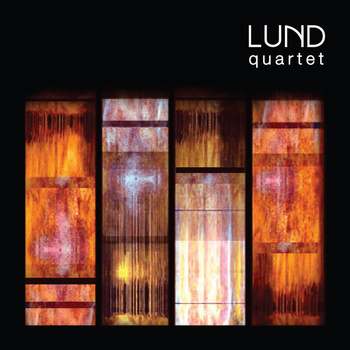 Having done some research, I find that Lund Quartet’s slick self-titled release is in actual fact their debut, which I am rather surprised by, given the level of accomplishment that simply oozes off it. This is smooth jazz, but not quite as we know it: for beneath the masterful piano, bass and drums, the rest is a seamless use of turntablism: although credit is due to the musicians sampled, the brass, the vocals, and all the other trappings are provided by one single turntablist, who provides an entire orchestra of sound with which to back the three highly-skilled conventional jazz musicians, to produce an evocative, delectable mix of mellowness, grooves, and sheer enjoyable musicianship. Opener ‘Sequoia’ is an understatedly hip-hop style number, with just enough reliance on bass, percussion, and sampled loops to pull off such a concoction. The pace picks up as the piano takes the fore in the middle, but its resemblance to chilled-out electronica and hip-hop never remain too far away, which is what gives it its attention-grabbing charm. Following track ‘Kulde’ takes a far, far more conventional route, a lusciously atmospheric jazz number that employs a haze of samples and theremin to frame an otherwise steady, piano-driven lament of a track that relies on slow double bass and a prominent lead piano for its effect. ‘Tulipan’, likewise, holds an evocative piano melody as its driving force, using the samples to suggest conventional jazz then warp it through slight judders and rhythmic skips that tie in flawlessly with the rhythm section, even if the brass and strings do end up creating a slightly derivative product that is enjoyable yet in ways unremarkable. ‘Merula’ suffers similarly, being too much of a background piece to flourish, especially in the face of eerie closer ‘Zill Bells’, which uses its almost nine-minute runtime to create a full odyssey of ethereal theremin and samples, hissing wavelike percussion, and soulful, dark piano that create a truly memorable closing track. ‘Love’s Madness’ is the most obviously “modern” track, so to speak, using a soulful vocal loop to drive the point home in an obsessive way. As for Lonn, the violin use is exquisite, allowing the bass and piano to really shine through and create a huge, emotive sprawl of a piece that morphs without hesitation into a cheeky rhythmic play between the instruments and groove-driven turntable rhythms. Lund Quartet are set to make a stir on the jazz scene. They have their moments of straying into a slightly generic niche in terms of what they do with their tools, but what they have and how they employ it, equally lead to some compelling and extremely well-executed pieces.